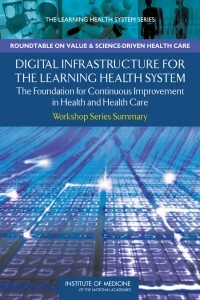 To facilitate progress toward the development of a learning health system — in which science, informatics, incentives, and culture are aligned for continuous improvement and innovation, with best practices seamlessly embedded in the delivery process and new knowledge captured as an integral by-product of the delivery experience — the Leadership Consortium for a Value & Science-Driven Health System has marshaled the insights of the nation’s leading experts to explore in detail the prospects, and the necessity, for transformational change in the fundamental elements of health and health care. The assessments are reported in the 15 volumes of the Learning Health System Series, published by the National Academies Press. 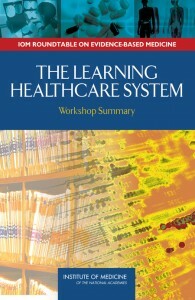 The Learning Healthcare System, the first in the series, explores the various dimensions — evidence development and standards, care culture, system design and operation, health data, clinical research, information technology, value — on which emerging insights and scientific advances can be applied for health care in which both evidence development and application flow seamlessly and continuously in the course of care. 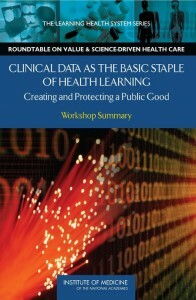 Clinical Data as the Basic Staple of Health Learning: Creating and Protecting a Public Good identifies the transformational prospects for large interoperable clinical and administrative datasets to allow real-time discovery on issues ranging from disease etiology to personalized diagnosis and treatment. Also explored are key priorities for data stewardship if clinical data are to be a carefully nurtured resource for continuous learning and better care. 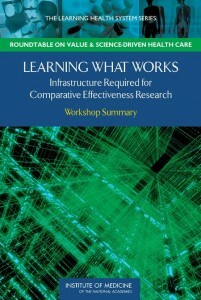 Learning What Works: Infrastructure Required for Comparative Effectiveness Research assesses the nature and magnitude of needed capacity for new knowledge and evidence about what care works best under different circumstances, including the necessary skills and workforce, data linkage and improvement, study coordination and results dissemination, and research methods innovation. 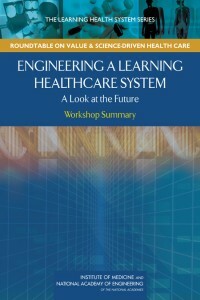 Engineering a Learning Healthcare System: A Look at the Future reviews transferable lessons from the systems and operations engineering sciences applicable for improving the organization, structure, and function of the delivery, monitoring and change processes in health care — in effect, engineering approaches to continuous feedback and improvement on quality, safety, knowledge, and value in health care. 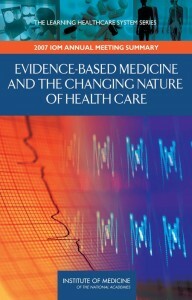 Evidence-Based Medicine and the Changing Nature of Health Care explores the forces, such as genetic insights and increasing care complexity, driving the need for better medical evidence; the challenges with which patients and providers must contend; the need to transform the speed and reliability of new medical evidence; and the legislative and policy changes that could enable evolution of an evidence-based, learning system. 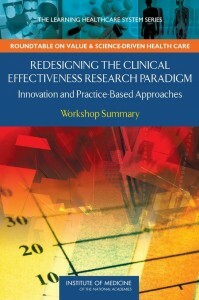 Redesigning the Clinical Effectiveness Research Paradigm: Innovation and Practice-Based Approaches reviews the growing scope and scale of the need for clinical effectiveness research alternatives, the limits of current approaches, the potential for emerging research and data networks, innovative study designs, and new methods of analysis and modeling. Digital Infrastructure for the Learning Health System: The Foundation for Continuous Improvement in Health and Health Care explores current efforts and opportunities to accelerate progress in improving health and health care, and identifies priority follow-up action targets: technical innovation; data and research insights; patient and public engagement; and stewardship and governance. 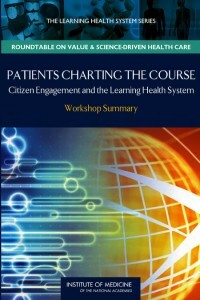 Patients Charting the Course: Citizen Engagement and the Learning Health System assesses the prospects for improving health and lowering costs by advancing patient involvement in the elements of a learning health system, and underscores the centrality of communication strategies that account for and engage individual perspectives, needs, preferences, understanding, and support necessary to mobilize change. 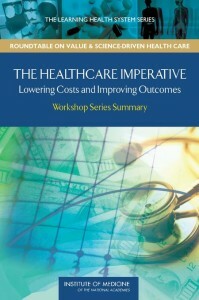 The Healthcare Imperative: Lowering Costs and Improving Outcomes presents a 6-domain framework for understanding and estimating excess healthcare costs: unnecessary services, inefficiently delivered services, excessive administrative costs, prices that are too high, missed prevention opportunities, and medical fraud. Additionally, the volume summarizes estimates of the excessive costs, reviews approaches to their control, and considers ways to reduce health expenditures by 10% within 10 years, without compromising health status or valued innovation. 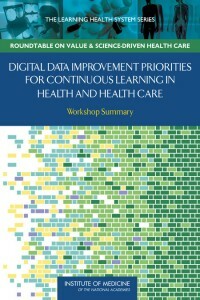 Digital Data Improvement Priorities for Continuous Learning in Health and Health Care presents the current deficiencies in the reliability, availability, and usability of digital health data and considers strategies, priorities, and responsibilities to address such deficiencies, as the totality of available health data is a crucial resource that should be considered an invaluable public asset in the pursuit of better care, improved health, and lower health care costs. 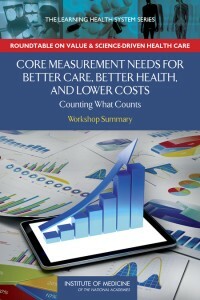 Core Measurement Needs for Better Care, Better Health, and Lower Costs: Counting What Counts considers needs, approaches, and metrics most important for tracing progress on care that is better quality, lower cost, and yields better health outcomes, and accounts for factors influencing the implementation of core measure sets, including the data infrastructure, resources, and policies that are needed for the use of core metrics across independent organizations and providers. 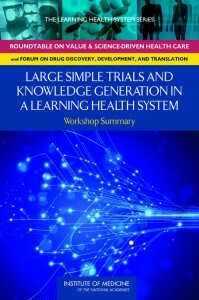 Large Simple Trials and Knowledge Generation in a Learning Health System presents the pros and cons of the design characteristics of large simple trials (LSTs), explores the utility of LSTs on the basis of case studies of past successes, and considers the challenges and opportunities for accelerating the use of LSTs in the context of a U.S. clinical trials enterprise. 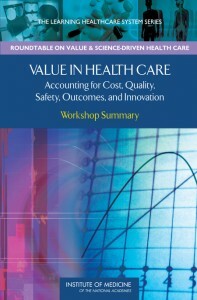 Value in Health Care: Accounting for Cost, Quality, Safety, Outcomes, and Innovation explores alternative perspectives and approaches for defining, estimating, and attaining value in health care, including case studies on value-enhancing strategies in development—e.g. value-based insurance design, accountable care organizations— and emphasizing the basic need for broad transparency as to cost, quality, and outcomes in care. 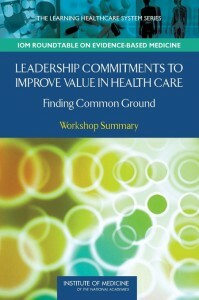 Leadership Commitments to Improve Value in Healthcare: Finding Common Ground presents discussions of opportunity statements from those in key health stakeholder sectors—patients, clinicians, health organizations, insurers, product manufacturers, employers, government, IT, and researchers—on priority actions they can and will undertake cooperatively to transform quality and value in health care. 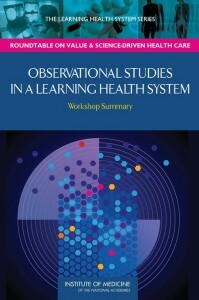 Observational Studies in a Learning Health System reviews leading approaches to observational studies and how to chart the course for the use of this growing utility in the most responsible fashion possible by considering how they can be made more rigorous and internally valid, how to deal with bias, the use of observational studies to generalize findings from randomized controlled trials, and how to evaluate treatment heterogeneity. 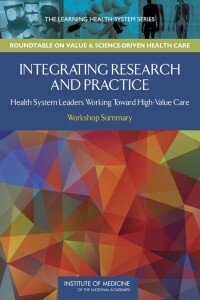 As explored in Integrating Research and Practice: Health System Leaders Working Toward High-Value Care, health care has been called one of the most complex sectors of the U.S. economy. Driven largely by robust innovation in treatments and interventions, this complexity has created an increased need for evidence about what works best for whom in order to inform decisions that lead to safe, efficient, effective, and affordable care. As health care becomes more digital, clinical datasets are becoming larger and more numerous. Empowering patients and families to become active partners in their health care — not merely passive participants — is a critical step on the road to achieving the best care at lower cost. Yet the changes necessary to transform the patient role are significant. Encouraging patient engagement in care decisions, value, and research is crucial to achieving better care, improved health, and lower health care costs. 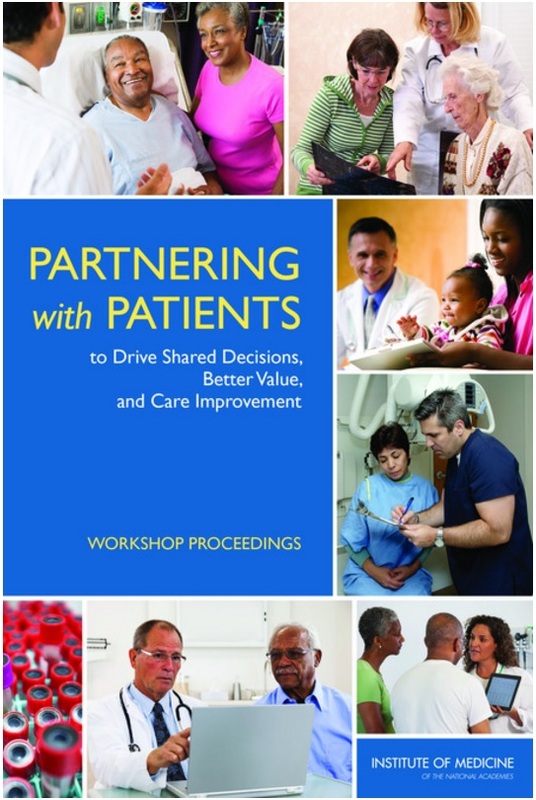 This publication details discussions during the February 2013 IOM workshop, sponsored by the Gordon and Betty Moore Foundation and the Blue Shield of California Foundation. The event gathered patients and experts in areas such as decision science, evidence generation, communication strategies, and health economics to consider the central roles patients can play to bring about progress in all facets of the U.S. health care system. The workshop built on the ongoing work of the Roundtable on Value & Science-Driven Health Care to raise awareness and demand from patients and families for better care at lower costs and to create a health care system that learns and improves continuously. 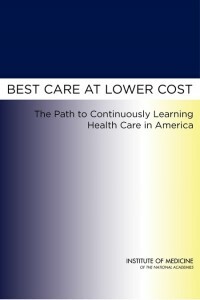 Best Care at Lower Cost: The Path to Continuously Learning Health Care in America explores the central challenges to health care today and identifies three major imperatives for change: the rising complexity of modern health care, unsustainable cost increases, and outcomes below the system’s potential, and points out that emerging tools like computing power, connectivity, team-based care, and systems engineering techniques—tools that were previously unavailable—make the envisioned transition possible, and are already being put to successful use in pioneering health care organizations. 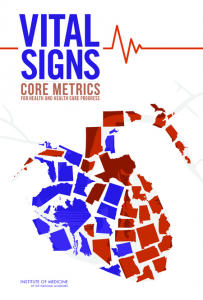 Vital Signs: Core Metrics for Health and Health Care Progress confronts the challenges of the thousands of measures in use today to assess health and health care in the United States. Although many of these measures provide useful information, their sheer number, as well as their lack of focus, consistency, and organization, limits their overall effectiveness in improving performance of the health system. To achieve better health at lower cost, all stakeholders — including health profes­sionals, payers, policy makers, and members of the public — must be alert to the measures that matter most. What are the core measures that will yield the clearest understanding and focus on better health and well-being for Americans? 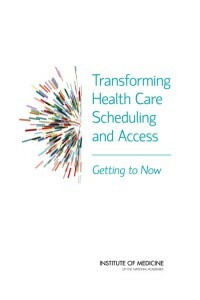 According to Transforming Health Care Scheduling and Access: Getting to Now, long waits for treatment are a function of the disjointed manner in which most health systems have evolved to accommodate the needs and the desires of doctors and administrators, rather than those of patients. The result is a health care system that deploys its most valuable resource — highly trained personnel — inefficiently. The report offers preliminary observations about emerging best practices and promising strategies (including virtually immediate engagement), concluding that opportunities exist to implement those practices and strategies, and it presents recommendations for needed approaches, policies, and leadership.